FREDDIE Roach said that, if they don’t get Floyd Mayweather, Keith Thurman is his second choice for Manny Pacquiao’s next opponent. Thurman, 30, the WBA super welterweight champion, readily called out Pacquiao after scoring a majority decision conquest of Josesito Lopez in Brooklyn, New York on Sunday. Pacquiao is listed as the WBA regular welterweight champion. The undefeated Thurman, 29-0, fought again after a 22 month lay-off caused by hand and elbow injuries. Thurman did not look anything special in out-pointing Lopez. He scored a knockdown in the second round, but was shaken and survived a furious attack from Lopez in the seventh round. Thurman appeared ordinary and predictable. But Roach said he loved him for Pacquiao’s style. Thurman, lacking the enthusiasm, could be considered a serious challenge (to Pacquiao), all for the simple fact that the noisy and boisterous Adrien Broner ended up a howling joke in losing to Pacquiao in Las Vegas on Jan. 19. Broner, who came in with a hollow middle, did not have the heart and toughness, but had the fast feet to escape Pacquiao’s power, determination and sharpness. There’s no assurance a Pacquiao-Thurman fight would be compelling and competitive, but fight promoters could lean on the fact that the WBA is in the process of cleansing its ranks of “excess” weight division champions. The winner would be automatically declared the lone rightful WBA crown-holder. Thurman said he would be ready and willing to fight Pacquiao anywhere. Pacquiao, in Hong Kong when last heard of, has not responded to Thhurman’s challenge. 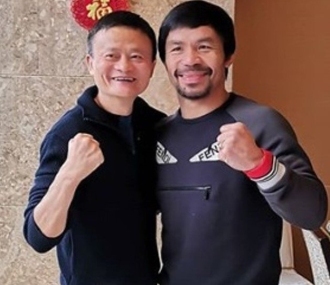 Photo: Manny Pacquiao poses with Chinese tycoon Jack Ma in Hong Kong on Sunday.